WATTAGE REDUX: It’s officially called the Citi Pond℠ Tree Lighting, but that doesn’t exactly make you feel all warm and Kris Kringly and eggnoggy, does it? 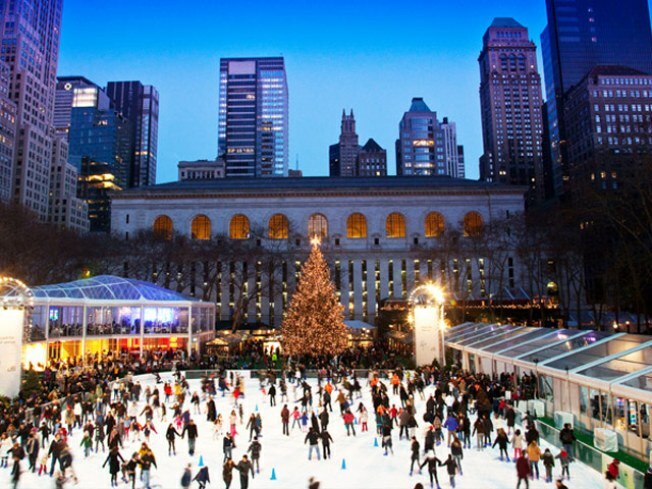 So let’s ear it for tonight’s Bryant Park Tree Lighting: the 50-foot fir presiding over the (free!) ice skating rink gets juiced at the conclusion of a program of entertainment featuring synched skate-dancing, performances from the casts of Rock of Ages and Billy Elliott, and more. 6PM. MARKET TABLE: Where can you go to fill your pie-hole with an advent calendar’s worth of delectable eats? The just-opened Columbus Circle Holiday Market (at the southwest entrance to Central Park, overlooking Columbus Circle) isn’t just charming gift stalls: It has a drool-worthy dining section that includes eats from Pies N’ Thighs, Crif Dogs, the Fatty Crew--Fatty ‘Cue, Fatty Crab and Cabrito. Come hungry. Open until 8PM nightly through December 24. WORD OF MOUTH: The First Couple of Gotham food, Tim and Nina Zagat, will be at the Strand Bookstore to celebrate the release of their 2011 New York City Restaurant Guide and discuss the gastro-culinary scene. The only thing better than giving a Zagat guide as a holiday gift? Giving a signed guide. Stock up. 7PM. See our music picks on the Nonstop Sound blog.